Country Cool is a straight shootin' comedy show that laughs at what we're all dealin' with....The "this can't really be happening" moments in life, that make us all feel like we're loosing our minds one traffic jam at a time. 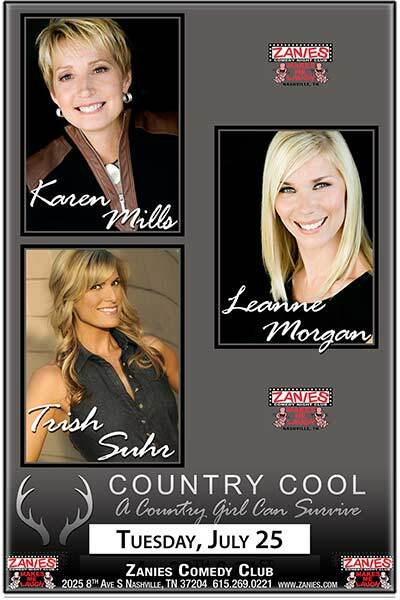 Trish Suhr, Karen Mills, and Leanne Morgan all have southern roots but are well traveled, diverse, sharp and savvy . They're no non-sense approach "tells it like it is" but of course with charm and style. It's not redneck, it's not white trash, these girls are country cool! It' s comedy for the masses, because let's face it, doesn't matter who you are....everybody's got a little country in 'em! These three women have been friends for over a decade and have stood in it, walked through it, and come out the other side laughing. Whether it's over coming Cancer , burying a beloved pet, or talking each other down from the hormonal ledge, they continue to prove that a country girl can survive by finding the funny in any situation. Their take on everything from marriage and kids to aging in a world that worships youth, will keep you in stitches. This comedy show runs the gamut...topics ranging from sports to mastering technology to their undying support for the troops, gives them a universal appeal that both men and women can relate to. Karen Mills has been in the humor business for 21 years. As a stand up comedian, she has toured clubs, colleges and theaters across the country and can be heard daily on Sirius / XM Laugh USA, Blue Collar Radio, iHeart Radio and Pandora. As a speaker, Karen has delivered the keynote, spoken at survivor events, fundraisers, sports banquets and given commencement addresses. Whether she is touring theaters with her comedy show or speaking at conferences, Karen is a master at finding the funny in everyday life. That didn’t change when she was diagnosed with ovarian cancer. Karen was determined to take on the disease with hope and humor and turn her pain into punchlines. Now cancer free, she has been hailed for her ability to bring humor to difficult topics as she recently did when she spoke at the National Alliance for Ovarian Cancer in Washington, D.C.
Karen has faced every challenge with determination, she stands at 5’2” and was told more than once that she was too small to play basketball. Not only did she play, in 1981 she led the nation in assists and became the first, division 1 first team All-American in UT-Chattanooga’s history. She was the first UTC athlete to earn that distinction in any sport, male or female. Her #12 uniform was retired and she became the first female inducted into UTC’s basketball Hall of Fame. Whether you are having a convention, a sales meeting, weekend retreat, or any other corporate or private function, laugh and be inspired as clean comedian Karen Mills brings your crowd together through the joy of laughter. One of the many great things about stand up comedy is the widely varied circumstances that lead people to jump on stage for the first time to tell jokes to entertain. The where, when, and how is often as intriguing as the comedy itself. For many it comes later in life after leading successful careers as teachers, lawyers, or corporate executives. What is more rarely seen is for a mother of three, living in rural Appalachia, who grew up on a farm within a truly extended family to find her way to the stage of stand up. Leanne’s journey into comedy is far from the standard profile but so intertwined into her act and success that it would be hard to imagine her starting any other way. As a stay at home mother of three, Leanne was looking for a way to get some grown up time without interfering with her children or her husband’s career. She turned to selling jewelry at in home parties. Word of her wonderful sense of humor and intoxicating southern charm spread like wildfire and she was staying booked months in advance. She was so popular that local civic organizations would ask her to host and emcee various events. From here she was asked to entertain several local corporate events and a professional comedy career was born. A move to Texas with her husband’s career opened many new opportunities for Leanne. While in San Antonio she was asked to appear in the Las Vegas Comedy Festival and appeared on ABC’s The View in a hilarious housewife segment. After returning to Knoxville, Leanne appeared as a finalist on Nick at Nite’s Funniest Mom and toured three years with the Southern Fried Chicks. She has appeared in comedy clubs, performing arts centers, and theatres all over the United States. She is currently under contract with Warner Brothers and ABC to develop a sitcom based on her comedy. This Kentucky native left the family funeral business to become a standup comedian. Trish is a regular performer on the all-female comedy show Pretty Funny Women and is featured on the Southern Belles of Comedy DVD Starring Brett Butler; she has even traveled the world to entertain the troops (and help organize their tents). TV appearances include Girls Behaving Badly, Take My Kids, Please and National Lampoon's Funny Money, Gamers and Uncle Eddie's Christmas Vacation. She appeared in Sam Raimi's The Quick and the Dead and starred opposite Dane Cook in the indie hit Spiral.